Brazil's Foreign Minister says relocation of country's embassy to Jerusalem must be a "positive movement". Brazil is "still studying" the relocation of its embassy in Israel to Jerusalem, Brazil's top diplomat said Wednesday, according to AFP. The comments by Foreign Minister Ernesto Araujo come days before President Jair Bolsonaro is due to visit Israel. Bolsonaro announced after his election that he intended to uphold his campaign promise and move the Brazilian embassy to Jerusalem. 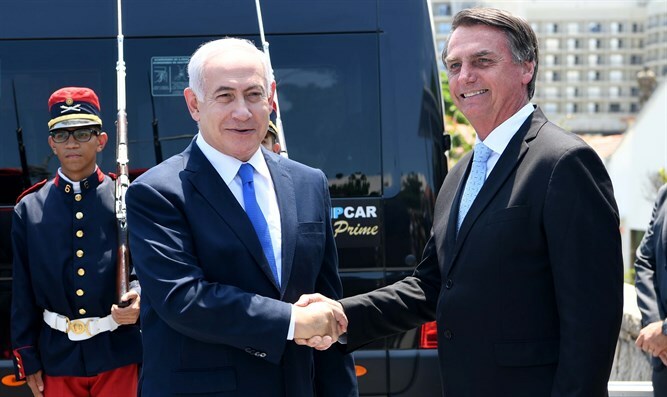 While Prime Minister Binyamin Netanyahu hailed Bolsonaro's announcement, Arab leaders have condemned the move and have pressured Bolsonaro not to go through with it. Araujo's latest remarks, however, suggest the controversial proposal is still on the table. "The issue of Jerusalem is very important, it is part of the essence of what this new relationship with Israel may mean, we are still studying the way that (decision) will be taken," Araujo told reporters, according to AFP. Bolsonaro, who has been in the United States this week for talks with President Donald Trump before going to Chile, is due to visit Israel from March 31 to April 2. Netanyahu attended Bolsonaro's January 1 inauguration in Brazil. The Arab League recently warned Bolsonaro that moving his country’s embassy in Israel to Jerusalem would be a setback for relations with Arab countries.